Mps1-IN-1 is a potent, selective and ATP-competitive Mps1 kinase inhibitor, with an IC50 and a Kd of 367 nM and 27 nM. 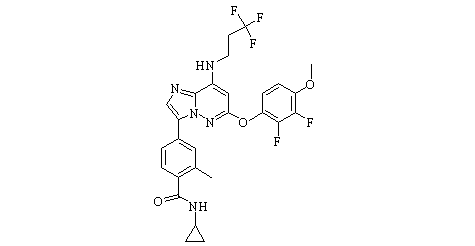 MPI-0479605 is a potent and selective ATP-competitive inhibitor of Mps1, with an IC50 of 1.8 nM. Mps1-IN-2 is a potent Mps1 kianse inhibitor with IC50 value of 145 nM. CCT251455 is a potent and selective mitotic kinase monopolar spindle 1 (MPS1) inhibitor with an IC50 of 3 nM. AZ3146 is a potent and selective monopolar spindle 1 (Mps1) kinase inhibitor (IC50 = 35 nM). NMS-P715 analog is an inhibitor of MPS1, with an IC50 of 84 nM. 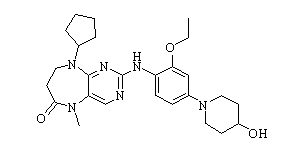 NMS-P715 is a selective, ATP-competitive inhibitor of MPS1, with an IC50 of 182 nM. BAY1217389 is an orally bioavailable, selective inhibitor of the serine/threonine kinase monopolar spindle 1 (Mps1, TTK), with potential antineoplastic activity. Empesertib is a potent Mps1 inhibitor, with an IC50 of < 1 nM.